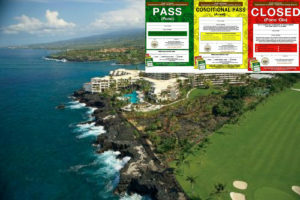 A Notice of Violation and Order against Kona Surf Partners LLC (dba Sheraton Kona Resort & Spa at Keauhou Bay) was issued by the Hawaiʻi State Department of Health for operating their “Da Dog House” food establishment without a valid DOH permit. A penalty fine of $20,000 was issued. The company has 20 days to request a hearing to contest the notice. On Jan. 12, 2018, a DOH health inspector observed the Sheraton Kona Resort & Spa selling prepared food at their “Da Dog House” food establishment. At the time, “Da Dog House” did not possess a valid food establishment permit issued by the DOH as required by state law. In addition, the Sheraton Kona Resort & Spa at Keauhou Bay posted a copy of their Convention Center food establishment permit at the “Da Dog House” site. It was determined the establishment had been operating illegally since Dec. 24, 2017. Sheraton Kona Resort & Spa at Keauhou Bay is located at 78-128 Ehukai Street, Kailua-Kona. For more information on the department’s food safety program, click here.